Coinbase Pro is an evolution of GDAX, the Global Digital Asset Exchange owned by Coinbase Inc. On June 29 Coinbase said good-bye to GDAX and transitioned to Coinbase Pro with all customers shimmying over to the new platform. 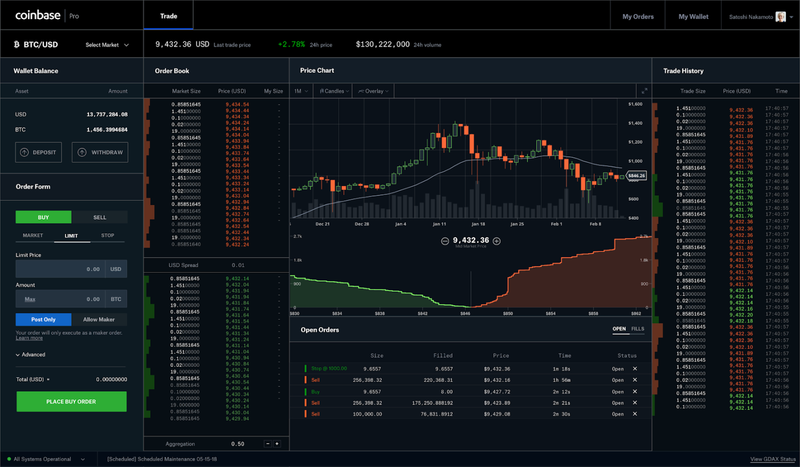 “Coinbase Pro is a new interface built on top of the existing GDAX trading engine that has been designed with the needs of the active trader in mind,” said David Farmer, General Manager of Coinbase Pro, in a blog post. Coinbase Pro currently operates in the U.S., Europe, UK, Canada, Australia, and Singapore. However, Canadian, Australian, and Singaporean accounts include only access to cryptocurrency without access to fiat. Coinbase Pro is a trading platform for individual traders and crypto enthusiasts. It allows individuals to instantly buy, sell, and trade digital assets online across various trading pairs. The exchange currently supports Bitcoin, Ethereum, Litecoin and Bitcoin Cash. At the moment of publication as according to CoinMarketCap.com, Coinbase Pro has a daily trade volume of roughly $67 million and is listed as 20th largest cryptocurrency exchange worldwide. Coinbase Pro requires a two-step identity verification before allowing users to deposit funds and start trading. U.S. customers will be required to upload a driver’s license or state ID. Passports will not be accepted for identity verification, as Coinbase Pro is not supported in Wyoming and Hawaii. In addition, users in the U.S. will have to provide their residential address and the last four digits of the Social Security number (SSN). Users in the United Kingdom are required to upload an ID document, driver's license, or passport. Furthermore, they will be asked questions to verify the identity against national identification databases. All other customers in Australia, Canada, Singapore, and the EU will have to upload two of the three acceptable documents: passport, driver’s license or national ID card. Currently Coinbase Pro does not accept transfers from contract-generated transactions. Therefore, ETH from an Ethereum contract cannot be deposited. The deposits made via the ACH bank transfer system usually take 3-5 business days to complete, while bank wire transfers may be credited to the Coinbase Pro account on the same day if submitted by 1:00 PM PT. Otherwise, funds will be available after one business day. Only Euros are accepted for SEPA transfers, other currencies such as USD, GBP or others will be rejected by the systems and the funds will automatically be returned to the user’s bank account. Coinbase Pro uses a maker-taker fee model for determining its trading fees. Takers will pay a fee between 0.10% and 0.30%, while makers will not be charged any fees. Coinbase Pro charges no fees for signing up or holding funds on your account. Therefore, assets can be held as long as necessary, the account will not be closed due to inactivity. Deposits in cryptocurrency or via bank wire (USD only) are unlimited, while deposits of fiat currency via ACH transfers or SEPA are limited based on the user’s weekly bank transfer limit. As for withdrawals, the limit is $10,000 a day upon registration. This amount applies across all currencies. There is no limit to the amount of orders that can be placed across all markets, but there is a limit on the size or amount for each order. The smallest order that can be placed for a buy or sell trade on Coinbase Pro is 0.001 BTC, 0.01 BCH, 0.01 ETH, or 0.1 LTC. Smaller orders will be automatically rejected by the system.